Will you forgive me for posting about salmon twice in the same week? And for not getting this recipe to you in time for your Easter Brunch menu planning? Even if you do not forgive me you should still make these deviled eggs. After all, Mother’s Day is coming soon and these would look so beautiful on your table. Not to mention, the season of picnics, bridal showers, and pool parties will be here before you know it. 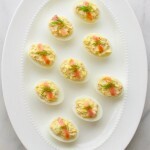 Deviled eggs may seem so “old fashioned” but you would be surprised how happy people are when they see deviled eggs being served. Deviled eggs manage to be comfort food and elegant at the same time. There is also something about those sunny yellow yolks that always make me smile. When I put these in my kids’ lunches, I earn “favorite parent” status for a couple days. They are that good. Place eggs in a single layer in a saucepan and add enough cold water to cover by 1 inch. Bring water just to a boil over high heat. Remove the pan from the heat, cover and let stand for 15 minutes. Then rinse eggs under cold water until cool enough to handle. Combine eggs yolks with other ingredients (except for those used for garnishing) until mixture is well combined. Using a small spoon, fill each egg white half with the egg yolk mixture. Garnish with a sliver of smoked salmon and a tiny sprig of dill, if desired. Recipe from the Deviled Eggs cookbook via the Houston Chronicle.